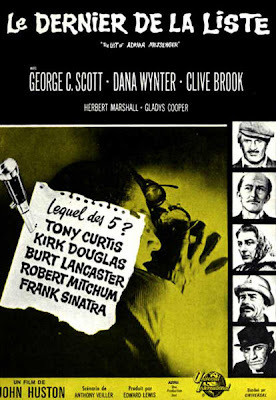 I'm halfway into John Huston's autobiography, An Open Book, and am watching some of his films, including this one, where George C. Scott tries to find out who killed Adrian Messenger and why and Kirk Douglas is one of the suspects. It's an intriguing film, but having star actors wearing masks seems like too much of a gimmick, or at least it could have been better integrated into the story in the film. You can easily see which characters are wearing masks, but it's not always easy to see who they are. Robert Mitchum is betrayed by his voice. Apparently the other ones just turned up for the unmasking at the end, with doubles doing the other scenes, making it even more pointless. A remake wouldn't make me weep into my pillow or curse the sky.